This is the question that follows my children consuming their dinner every single night. Their love of sugar comes from their father’s DNA (while a slim guy, I swear that man is made up of 55% pie). They are allowed one sweet treat a day and it is after they eat a healthy dinner. But only after they do the one thing no child likes to do… clean up their toys from earlier in the day. This day they had been playing with Legos and my youngest was picking up a couple at a time and walking them over to the bin. Take two, walk them over. Take another two. And walk them over. The way this was going, she wasn’t going to get to her dessert until she was old enough to drive. I walked over to her, picked up the bin and brought it to the Legos on the floor. “Katie, just put them right in the bin here. You’ll be done much quicker.” And with that, in less than a minute clean-up was over. And the dessert of choice for the night—a mini peppermint ice cream sandwich—was chosen. What Katie struggled with and then discovered is similar to what many of us as business owners want. We’d like to speed up the work and get to the dessert as quickly as possible. And thankfully, there is a way to do that. In fact, there are 8 Ways. Most people think that you need to revolutionize your business and yourself to increase profits. But in reality, you can make a few small tweaks and dramatically increase your revenue and profits. The first place most businesses look to attract more leads is adding more marketing channels. Maybe we should open up a LinkedIn account?! Or Snapchat? Should we do a billboard? Use more images. Your Facebook Fans are on the network surrounded by their friends and family. Create images with WordSwag or Canva with quotes from your blog or articles and then a link for readers to get more. Then each time your audience likes, comments, or shares, you are attracting more leads. Often you don’t need to do anything new in your lead attraction to increase profits. You could just capture more leads. Think about it… there are multiple people coming to your Facebook Page and to the landing page that are not opting in. 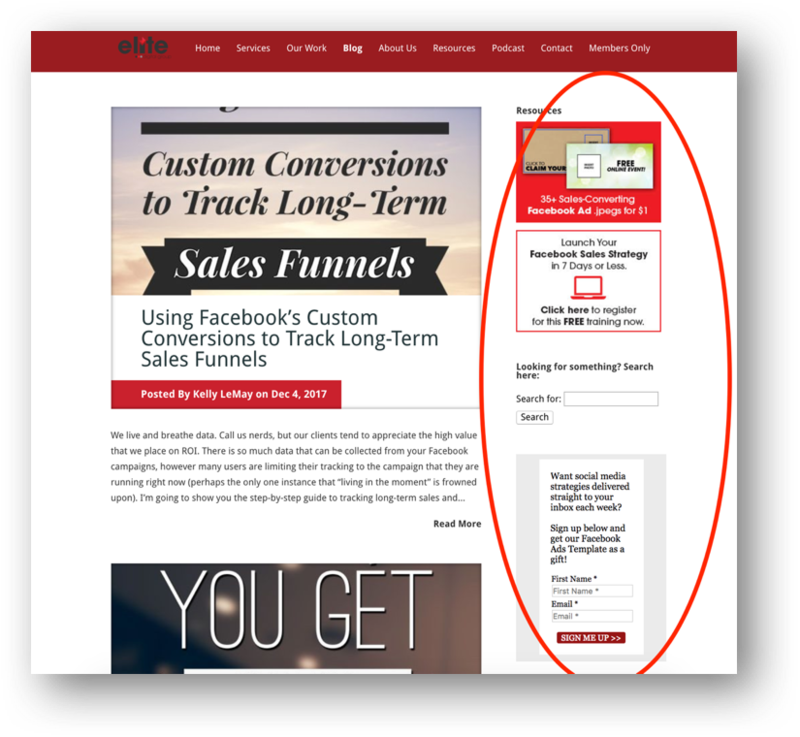 If you just increase that number by 10%, it can mean tens of thousands of new leads and dollars in your pocket each year. Add a link to all of your posts. ALL OF THEM. 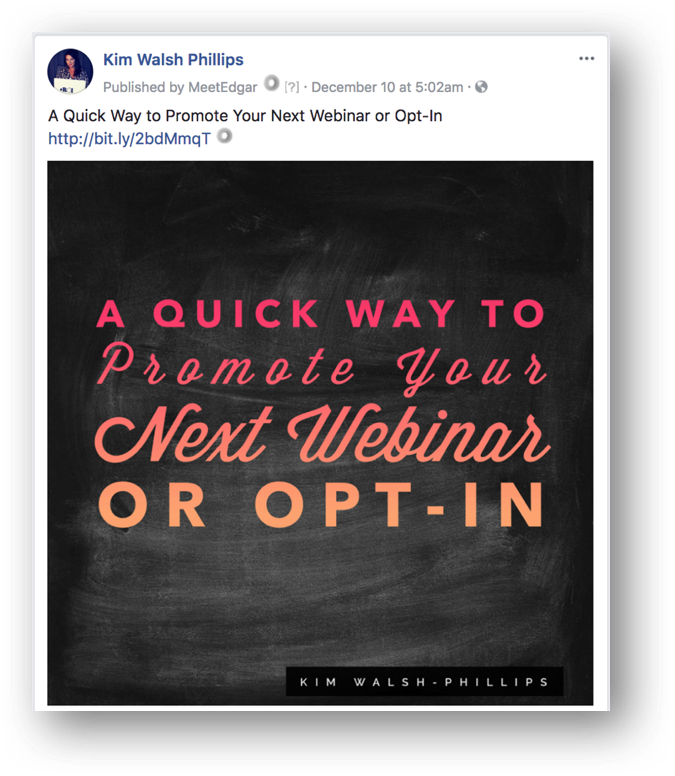 The advantage Facebook has over other social media platforms is that you can include a link with each of your visual posts. Create images with WordSwag or Canva with quotes from your blog or articles and then a link for readers to get more. Then each time your audience likes, comments, or shares, you are attracting more leads. A) In-line calls to action. Within the post, offer a chance to get more from you in the next step through another product, program, or service. B) Side bar. 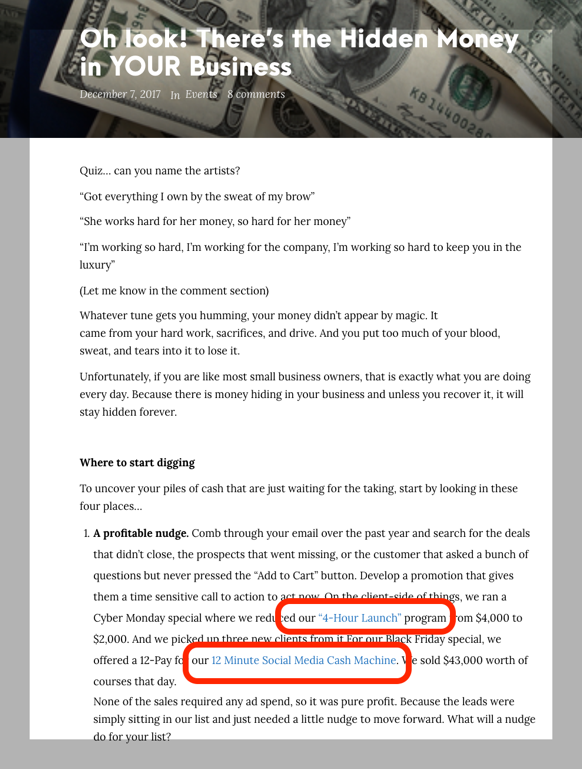 Post ads on your site for your other offerings. C) Bolded call to action at the end of your post. Tell the reader exactly what you want them to do next. Start with one or two new tweaks and see the profit needle move. 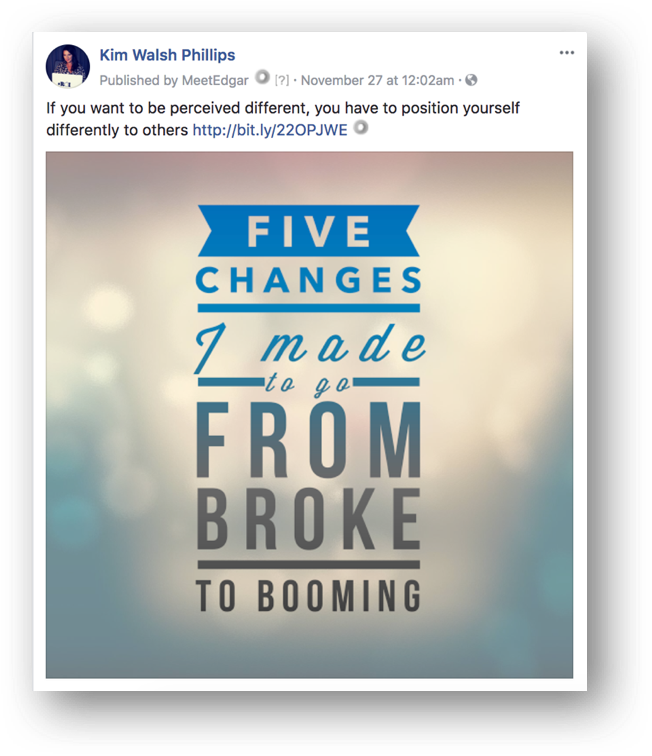 And then join us for “8 Ways To Double Your Profits In 56 Days Using Brain-Dead Simple Strategies. Thank you, however we are not interested. Have a great day!